The Alice Holt Community Forum consists of representatives from each of the parish councils, communities and villages which surround Alice Holt Forest, and from the Forestry Commission. Its members have considerable cumulative knowledge of Alice Holt Forest and the surrounding area and meet regularly. The objective of the Forum is to provide an efficient means whereby the Forestry Commission and the local community can exchange views on matters relating to Alice Holt Forest, thereby informing the management of the Forest. Alice Holt Forest is one of the largest surviving clusters of ancient and native woodland in South East England and is situated in the South Downs National Park. Throughout history, Alice Holt Forest has been a working forest, producing timber for shipbuilding, furniture making, building and wood for fuel. Alice Holt Forest today covers a total of 851 hectares (ha) of land, 92% of which is ancient woodland, of which approximately half is broadleaved and half conifers. The Forest is undergoing a programme of gradual ancient and native woodland restoration. 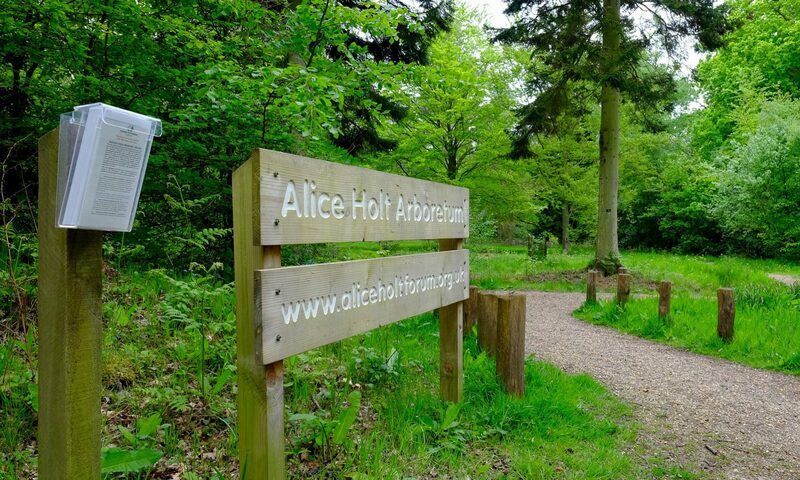 Alice Holt Forest has a rich biodiversity and receives over 300,000 visits from the public each year. The Forest lies between Farnham in West Surrey and Alton in North East Hampshire. 13 Jan 17 Feb Volunteering is open to all. Newcomers are very welcome. No special skills are required and tools are provided. If you would like to join us, please meet at the Arboretum entrance on the track leading from the car park off Gravel Hill Road. The grid reference for the arboretum is SU801432. If you would like to join us, please email us at aliceholtforum@gmail.com. The area of the arboretum was originally set up in the 1950s as a fenced research enclosure for testing trees for forestry. The research focused on a range of conifers and broadleaved species like alders, beech and hickory. By the mid-1970s, many of the experiments had finished, leaving behind an interesting variety of trees, and the area was then developed as an arboretum for people to enjoy. The arboretum has since 2011 been refreshed with repairs to the paths, installation of picnic benches, removal of overcrowded trees, cataloguing and labelling the important specimens, and planting the next generation of trees. By Spring 2019, some 90 new trees had been planted by volunteers. This trail highlights 30 of the many interesting trees to be found in the arboretum. Each tree is labelled and numbered, and its location shown on the attached map. 1. Oriental spruce (Picea orientalis). The boundary of the arboretum is planted with a mix of Oriental and Norway spruce. Oriental spruce is a beautiful spruce from the Caucasus and north-eastern Turkey, first introduced into Britain in 1839. Oriental spruce is one of the easiest spruces to identify because it has very short needles. The young cones are red, and it tolerates drier sites compared with other spruces. Take note of the mature oaks and hollies as you walk to the next tree. Many of the old oaks in Alice Holt were planted around 1820 to produce timber for warships. 2. Sweet chestnut (Castanea sativa). Native to south-eastern Europe and Asia Minor, sweet chestnut was introduced into Britain by the Romans. Roasted chestnuts are a familiar treat in winter, and sweet chestnut also produces valuable timber. It was widely coppiced in south east England to produce poles for hop farms. 3. Hybrid larch (Larix x marschlinsii). This deciduous conifer is a hybrid between European and Japanese larch (L. decidua x kaempferi), which first arose about 1897 at Dunkeld, Perthshire. For forestry, hybrid larch is superior to either parent, and many of the larch trees in the arboretum were deliberately bred to create superior forms. Unfortunately, larches in western Britain have been attacked by a new disease Phytophthora ramorum, which is related to potato blight. 4. Western red cedar (Thuja plicata). This evergreen conifer is not a true cedar but is a member of the cypress family. It is native to western North America and was introduced to Britain in 1853. It is widely planted as an ornamental tree in parks and gardens, and is commonly used for hedging. The timber is very resistant to rot and is used for outdoor construction, roof shingles and to make bee hives. The crushed foliage smells of pineapples. 5. Common beech (Fagus sylvatica). Unfortunately this specimen has had to be felled for safety reasons, due to disease. 6. Rauli (Nothofagus alpina). Rauli is a member of the same plant family as beech. It comes from Chile and Argentina where, amongst other uses, the timber is used to make barrels for fine wines. It is grown in Britain as an ornamental tree, and has been tested as a timber tree for forestry. Unfortunately, severe frost can damage Rauli, making it too risky to grow on a large scale. 7. Roble (Nothofagus obliqua). Roble is another southern beech from Chile that has been tested for forestry. It is also frost-tender, and tends to grow better than Rauli in the drier eastern part of the country. 8. Lodgepole pine (Pinus contorta var. latifolia). Lodgepole pine comes from western North America and this group contains trees raised from seed collected across the native range. It is named after its use for making Native American tipis or wigwams. It is planted in upland forests in Britain for timber and to help protect young Sitka spruce trees on exposed sites. 9. Scots pine (Pinus sylvestris). A familiar pine that is native to Europe and Asia and occurs naturally in Scotland in the Caledonian Forest. Scots pine is an important tree in forestry, and is also widely planted for ornament and to provide shelter. Its needles are in pairs, and the orangey-brown flaky bark in the upper trunk and branches help tell Scots pine apart from other two-needled pines. As the path curves round, stop and take in the view out over the landscape. The tall thin spruce at the back of the clearing is Serbian spruce (Picea omorika), which grows in limited areas of Bosnia and Herzegovina, and Serbia. The path continues through hybrid larch trees that were planted in the 1950s. 10. Coast redwood (Sequoia sempervirens). An evergreen redwood from coastal California and Oregon. Trees over 60 m are common in the wild, and the current tallest tree on Earth is 115.61 m high and is named Hyperion, which means ‘The High One’. This magnificent grove was planted in 1954 to test how well trees raised as rooted cuttings would grow. Note to your left some of the young trees, each of which is labelled, that have recently been planted by SDNP Volunteer Rangers. Most of these were raised at the Forestry Commission’s Westonbirt Arboretum or Bedgebury Pinetum. Then notice the outline of the trees on the skyline as you walk towards the next stop. The trees with branches that look like chimney sweep brushes are ponderosa pines (Pinus ponderosa) from western North America (See Tree 28 for some more information). 11. Leyland cypress (Cupressus leylandii). This fast growing conifer is familiar as a hedge plant; however, its vigorous growth habit has caused disputes between neighbours, giving Leyland cypress an anti-social reputation. In the forest, however, Leyland cypress can make an impressive timber tree, and given enough room in parks and (very) large gardens it can make an imposing specimen. 12. Italian alder (Alnus cordata). Italian alder is native to southern Italy and Corsica. Although introduced into Britain in 1820, it is not particularly common, yet it grows rapidly into a handsome tree. Like other alders, Italian alder fixes nitrogen in the roots, and has been planted on old mine tips with difficult soils to help create woodland cover. Alder fruits look like cones, and the heart-shaped leaves help distinguish Italian from other alder species. 13. Monterey cypress (Cupressus macrocarpa). This cypress comes from coastal California. Although it likes hot summers, Monterey cypress has been widely planted in Britain as an ornamental tree, and also occasionally for forestry in mild areas such as the Isle of Wight. Its main claim to fame is as one the parents of the hybrid Leyland cypress. 14. Douglas-fir (Pseudotsuga menziesii). Native to western North America, Douglas-fir was first introduced into Britain in 1827. Reputed to be one of the world’s most important timber species, it has been widely planted in Britain for ornament and forestry. Douglas-fir cones have a distinctive three-pointed scale that protrudes above each cones scale and resembles the rear half of a mouse running down a hole. 15. Dawn redwood (Metasequoia glyptostroboides). A deciduous redwood only known from fossils until living trees were recorded in China in 1941. This grove was planted as rooted cuttings taken off a tree raised from one of the earliest batches of seed collected in the wild. Dawn redwood is now an important ornamental tree. The path continues through beech and larch trees. 16. Sitka spruce (Picea sitchensis). This group was planted in 1954. First introduced from western North America in 1831, Sitka spruce is now our most important exotic timber species, growing particularly well on poor soils and exposed sites. Besides being used for pulp and construction, the timber is also used for making musical instruments, and was used to make Mosquito aircraft in the Second World War. The protective fairing of the nose cone of a Trident Missile is made from Sitka spruce. 17. Shagbark hickory (Carya ovata). Hickories are members of the walnut family from N. America and Asia. Hickory wood is hard, flexible and shock-resistant and is favoured for tool handles. ‘Carya’ is Greek for nut, and the related pecan (Carya illinoiensis) produces large edible nuts. 18. Coast redwood (Sequoia sempervirens). This specimen is bigger than the trees in the grove. The spongy bark insulates the trunk during fires, which are a feature of the natural forest. The tree is named in honour of a Native American, Sequoya, who in the nineteenth century invented an alphabet for the Cherokee language that became widely used. 19. Giant sequoia, Wellingtonia (Sequoiadendron giganteum). Giant sequoias grow in scattered groves in the Sierra Nevada, California, and are the largest trees on Earth in terms of volume – the biggest is the General Sherman at 1486.9 m3. English botanists wanted the scientific name to be Wellingtonia in honour of the Duke of Wellington, but this name wasn’t allowed because it had already been used to name a kind of palm. However, ‘Wellingtonia’ is still used in Britain as a common name for the tree. 20. Yew (Taxus baccata). There are several very old yew trees in Alice Holt Forest. This specimen is relatively young, but its trunk and branches have an interesting shape. Yew is one of three conifers that are native to the British Isles. Yew can live for a very long time, many of the largest and oldest are found in churchyards and some could be more than 2000-years-old. Most parts of the tree are poisonous. Yew wood was particularly favoured for making longbows. 21. Scrub pine (Pinus virginiana). This pine from eastern North America is rare in Britain. Scrub pine resembles Scots pine, however its cones are shaped like narrow cylinders and are spiny. 22. Weymouth pine (Pinus strobus). Unfortunately, this specimen has had to be felled for safety reasons, due to disease. 23. Western white pine (Pinus monticola). This pine is a relative of the Weymouth pine and grows naturally in western North America. It also has five needles in each bundle, and is susceptible to white pine blister rust. It has longer cones that its eastern relative. 24. Armand’s pine, Chinese white pine (Pinus armandii). This five-needled pine come from China. It has thick barrel shaped cones that can appear on quite young trees. The pine seeds are edible, and are dispersed in the wild by Spotted Nutcracker birds. It was first introduced to Europe by the French missionary and naturalist Father Armand David. 25. Pitch pine (Pinus rigida). Pitch pine comes from the eastern United States. It has three needles in each bundle and, unusually for a pine, it can produce new shoots directly on the trunk. It was once an important source of pitch for ship building. 26. Gregg’s pine (Pinus greggii). Gregg’s pine is native to Mexico where it grows in cool highlands. It has three needles in each bundle. It is rare in Britain, being found in a few collections. It is named in honour of Josiah Gregg who was a nineteenth century merchant, explorer and naturalist. 27. Jeffrey pine (Pinus jeffreyi). Jeffrey pine grows at high altitude in southwest Oregon, California, and Baja California in Mexico. It has three needles in each bundle, and is similar to ponderosa pine. However, Jeffrey pine releases a sweet scented resin when a twig or needles are broken, compared with the turpentine smell of ponderosa pine. The resin is highly volatile and is explosive when heated to make turpentine. A pure chemical in the resin was used in the development of petrol as a fuel, and Jeffrey pine is sometimes called ‘the gasoline tree’. 28. Ponderosa pine (Pinus ponderosa). Ponderosa pine is native to western North America, where it is known as western yellow pine and is a very important timber species. It has three needles in each bundle. The homestead in the classic 1960s TV western series ‘Bonanza’ was call the ‘Ponderosa Ranch’. 29. Leyland cypress (Cupressus leylandii). A single open-grown specimen of this hybrid cypress. Leyland cypress first arose in 1888 at Leighton Hall, Powys, where female cones of a Nootka cypress were fertilised by pollen from the male cones of a Monterey cypress. The resulting seedlings show intermediate characteristics of the parents, and great vigour! Since then, the hybrid crossing has happened at least 20 times, giving rise to a series of different Leyland cypress clones. 30. Dallimore’s horse-chestnut (Aesculus + dallimorei). This horse-chestnut is an unusual kind of hybrid, known as a chimaera, where the tissue from each parent has fused together when they were grafted to make specimen trees. It is named in honour of its discoverer, William Dallimore, who was a botanist at Kew and was the founder of the Bedgebury National Pinetum in Kent. The trunk and branches are covered in brown streaks caused by bleeding canker disease of horse-chestnut, which has infected many horse-chestnuts in recent years. You can now return to the starting point along Yew Walk, noting the many old yews, some ‘1820’ oaks, and some large cedars. Alice Holt Community Forum is working in partnership with the Forestry Commission England and the South Downs National Park Volunteer Ranger Service.